I’ve seen this movie before. In 1989, I was a fraud investigator hired to dig into the cause of the Exxon Valdez disaster. Despite Exxon’s name on that boat, I found the party most to blame for the destruction was ... British Petroleum (BP). That’s important to know, because the way BP caused devastation in Alaska is exactly the way BP is now sliming the entire Gulf Coast. Tankers run aground, wells blow out, pipes burst. It shouldn’t happen, but it does. And when it does, the name of the game is containment. Both in Alaska, when the Exxon Valdez grounded, and in the Gulf last week, when the Deepwater Horizon platform blew, it was British Petroleum that was charged with carrying out the Oil Spill Response Plans (OSRP), which the company itself drafted and filed with the government. What’s so insane, when I look over that sickening slick moving toward the Delta, is that containing spilled oil is really quite simple and easy. 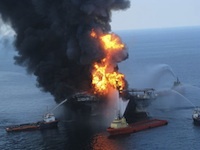 And from my investigation, BP has figured out a very low-cost way to prepare for this task: BP lies. BP prevaricates, BP fabricates and BP obfuscates. To contain a spill, the main thing you need is a lot of rubber, long skirts of it called a “boom.” Quickly surround a spill, leak or burst, then pump it out into skimmers, or disperse it, sink it or burn it. Simple. But there’s one thing about the rubber skirts: you’ve got to have lots of them at the ready, with crews on standby in helicopters and on containment barges ready to roll. They have to be in place round the clock, all the time, just like a fire department, even when all is operating A-O.K. Because rapid response is the key. In Alaska, that was BP’s job, as principal owner of the pipeline consortium Alyeska. It is, as well, BP’s job in the Gulf, as principal lessee of the deepwater oil concession. Before the Exxon Valdez grounding, BP’s Alyeska group claimed it had these full-time, oil spill response crews. Alyeska had hired Alaskan natives, trained them to drop from helicopters into the freezing water and set booms in case of emergency. Alyeska also certified in writing that a containment barge with equipment was within five hours sailing of any point in the Prince William Sound. Alyeska also told the state and federal government it had plenty of boom and equipment cached on Bligh Island. As chance would have it, I was meeting last week with Louisiana lawyer Daniel Becnel Jr. when word came in of the platform explosion. Daniel represents oil workers on those platforms; now, he’ll represent their bereaved families. The Coast Guard called him. They had found the emergency evacuation capsule floating in the sea and were afraid to open it and disturb the cooked bodies. Becnel, yesterday by phone from his office from the town of Reserve, Louisiana, said the spill response crews were told they weren’t needed because the company had already sealed the well. Like everything else from BP mouthpieces, it was a lie. In the end, this is bigger than BP and its policy of cheaping out and skiving the rules. This is about the anti-regulatory mania, which has infected the American body politic. While the tea baggers are simply its extreme expression, US politicians of all stripes love to attack “the little bureaucrat with the fat rule book.” It began with Ronald Reagan and was promoted, most vociferously, by Bill Clinton and the head of Clinton’s deregulation committee, one Al Gore. The answer is because government took you at your word they should get out of the way of business, that business could be trusted to police itself. It was only last month that BP, lobbying for new deepwater drilling, testified to Congress that additional equipment and inspection wasn’t needed. You should meet some of these little bureaucrats with the fat rule books. Like Dan Lawn, the inspector from the Alaska Department of Environmental Conservation, who warned and warned and warned, before the Exxon Valdez grounding, that BP and Alyeska were courting disaster in their arrogant disregard of the rule book. In 2006, I printed his latest warnings about BP’s culture of negligence. When the choice is between Lawn’s rule book and a bag of tea, Lawn’s my man. Why didn’t Halliburton check? “Gross negligence on everyone’s part,” said Becnel. Negligence driven by penny-pinching, bottom-line squeezing. BP says its worker is lying. Someone’s lying here, man on the platform or the company that has practiced prevarication from Alaska to Louisiana.